Simple love. | The zealot of fashion. yet it is the main thing that brings people together. it has to be built up through time and the things you go through together with many other aspects. I don't know much about love either and I'm still learning to love better each day. But I do know that love should be kept simple. I've seen true love. Genuine. Simple. No demands, no high expectations, just giving. 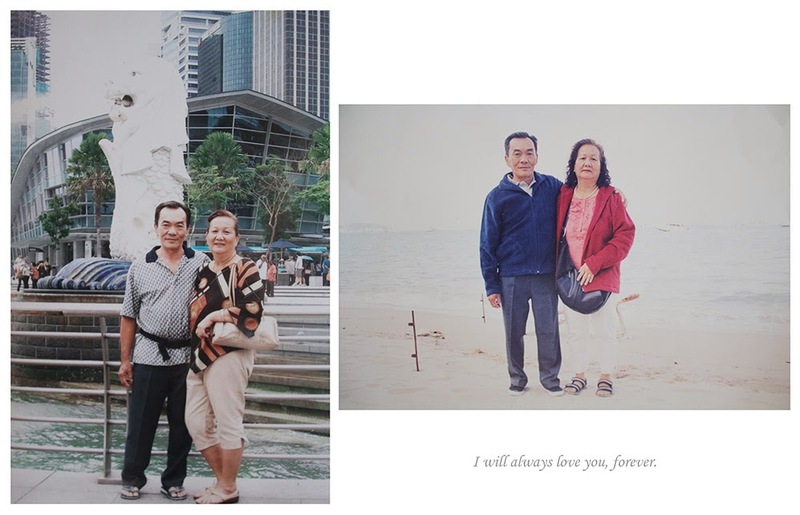 My grandparents has been married for 48 years, that is until my grandpa, I call him yeye (爷爷) passed away 3 years ago. According to Chinese tradition, we can't make dumplings (汤圆) until the 3rd year anniversary of his death. The good thing is we can make those little colourful dumplings now, but it also means my 爷爷 has left us for 3 whole years. 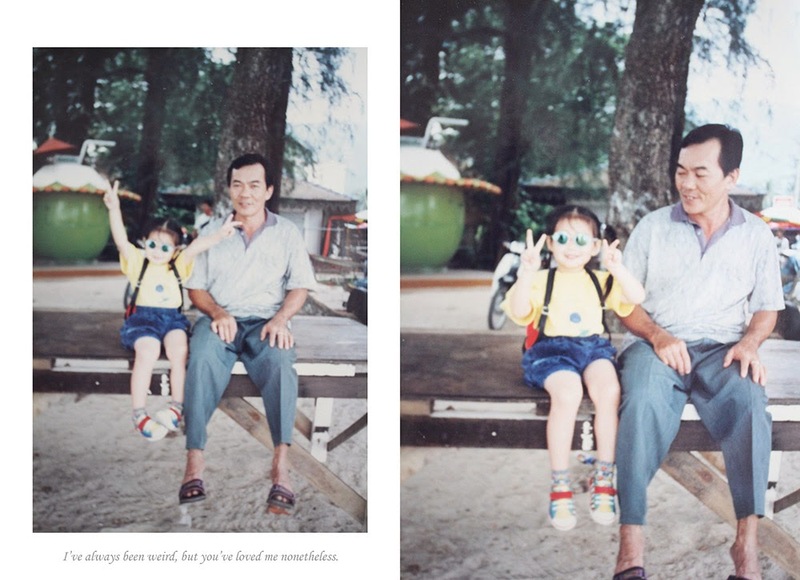 He took care of me since I was born so he was always like a father to me. I was the first born child of my generation and he doted me like I was his own. I respected and loved him very much. two strangers were brought together by fate. In the olden days when their children reach their late teenage years, the family of the male will seek matchmakers for girls to introduce for marriage. My grandma, I call her popo (婆婆) said they used to take photos wearing wedding gowns and stand in a row while the bride sits in the middle. You'll only get to be in the photo if you're ready to marry. Surprisingly my 婆婆 was not the first choice, it was another slightly petite lady. However, my great grandpa had higher standards for his eldest son and wanted another option. So his friend pointed out my 婆婆and said that she was a fine lady. My 婆婆's parents would evaluate my 爷爷 and ask him a few questions and so does my 爷爷's parents. My 婆婆 mentioned that she told her sisters that people in the past were dumb because they never disagreed to marrying strangers. It's like their parents would say, "so you're getting married to this young lad on this date." and they would just nod in acceptance. But she said she was glad she did not marry the wrong man. They eventually got married after dating for about 3 months. 婆婆 told me that life was tough after marrying my 爷爷 cause he was not from a wealthy family. He drove trucks sending stocks by day and catch hens by night, he was always working hard. Every single cent he earns, he gives it to his family. Well my 婆婆 didn't just sat at home waiting to be served. She has to walk a few hundred meters just to get pales of clean water for showering, cleaning and drinking purposes. Other than the typical house chores, learning how to cook home-made food and making clothes was one of her tasks at home too. My grandparents has 5 children, my dad has two brothers and two sisters, he is the second oldest. My 爷爷 worked so hard to feed 7 mouths and he has never been selfish or bias to his kids. Gladly my uncles and aunts were very well behaved and mature at a young age, helping and taking care of each other. My 爷爷 only retired when I entered primary school and he was still contributing to the family even when his children were all grown up, some married and all working. "所謂皇天不負苦心人" That means the heavens will not disappoint the person who tries and work hard, if they worked hard, they will succeed in life. And his greatest success are his capable and filial children. With that, they are given many opportunities to travel around the world together and they certainly love it! My grandparents never asked for anything in return but for his children to start a great family and live a good life. This is called unconditional love. After my 爷爷's passing, it left my 婆婆 devastated. She couldn't sleep or eat well for almost a year before she could get over it.She would day dream on the couch and the living room and sometimes cry silently while looking through old photos. It aches my heart just hearing her sorrowful voice over the phone when I'm back in Singapore. The thing is, my 爷爷 always had the best diet and was never picky with food. He works out every morning, well, a few stretches here and there and jogs occasionally. He eats on time, sleeps on time, wakes up on time; everything seems so consistent and normal. He died of stomach cancer and it was a shock to everyone. How can this be? Our conclusion was his time in this world was up. All I wanna say is, I miss you and I love you 爷爷. This is probably the only family photo (just the 6 of us) that we have and it's sad that I'll never have this photo retaken again. Most importantly is to cherish the moments we share and value our family members. When you were born, you weren't given a choice to choose your parents and neither does your parents gets to choose what type of children they want. But I believe that there is always a reason for something, I believe there's a reason why we are a family. No one else in this world would love you more than your family does. Only your family will give you unrequited and selfless love. Love yourself, love your family.